adidas and EA SPORTS™ have teamed up to create something special and completely new for hockey fans. The oldest National Hockey League (NHL) teams, in the newest format. The most storied franchises, writing a whole new chapter. The Original Six, making history again with the introduction of all-new Digital 6 jerseys in EA SPORTS NHL® 19. Digitally crafted, these original designs were created through a unique, first-ever collaboration between adidas, EA SPORTS and the Original Six NHL teams - Boston Bruins, Chicago Blackhawks, Detroit Red Wings, Montreal Canadiens, New York Rangers and Toronto Maple Leafs. At the forefront of innovation and design, the all-new looks are fashioned to honor the heritage of the Original Six teams, pay homage to the history and traditions of each city and explore the possibilities of the future. Boston Bruins – With the fighting spirit of a bear and a storied history that has defined their legacy, the Digital 6 jersey for Boston pays homage to the League’s first American team. The seven stripes and 13 stars surrounding their prominent logo represents the country's original 13 colonies, honoring the birthplace of a nation. The white color-blocking on the sleeves makes each player's number pop, and innovative body striping is exclusive to this jersey. Fans can unleash the attitude of a Bruin with this unique look, no matter their favorite team. Chicago Blackhawks – The Blackhawks’ Digital 6 jersey expands the seven colors from their logo into various areas of this design. No logo in professional sports features as many shades as Chicago’s jersey, which is why this design is so vibrant and powerful. The iconic jersey crest color palette was expanded out onto the sleeves with bold striping that stays true to their legacy. The threads weaved into the striped pattern on the Blackhawks jersey give it a classic appearance. Detroit Red Wings – The bold red and white stripes on the Red Wings’ Digital 6 jersey are inspired by Detroit's automotive history, adorned with the kind of racing stripes that decorated many local muscle cars. This fresh take on the 1926-27 jersey features an amped-up Red Wings logo forged from the heart of Hockeytown. New York Rangers – The Big Apple is grand and larger than life, which is why the Rangers’ Digital 6 jersey features an oversized crest with “New York” emphasized as the center of attention. Bearing the revered Rangers shield and wrapping it all the way around their jersey creates a balanced look between Home and Away designs with a striking presence that stands out like skyscrapers above the competition. Toronto Maple Leafs – This Digital 6 jersey makes each player look like a singular flying leaf. The untouched white area in the upper half of the jersey, combined with the frosted blue visor, pay homage to the winter cityscape when the ice has frozen over. 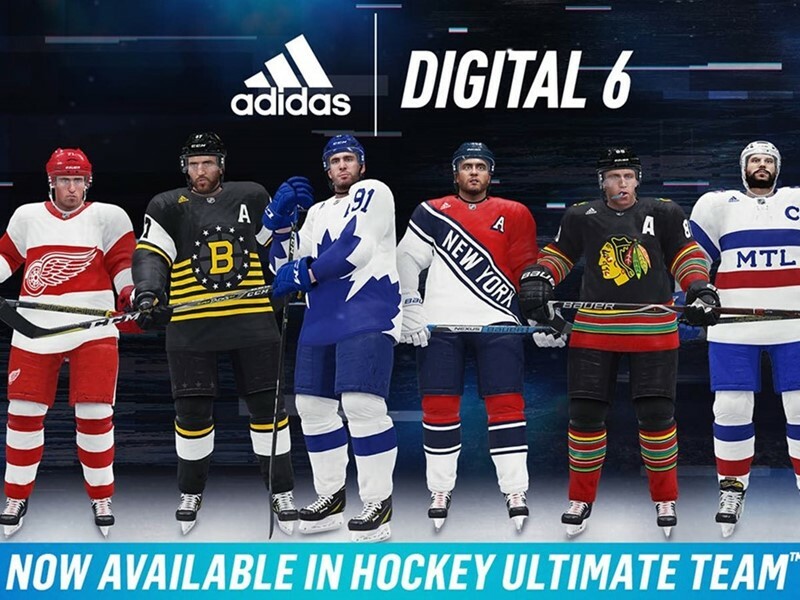 Players can get one of six jerseys featuring their favorite Original Six team by entering Hockey Ultimate Team in the game. Players must redeem the Digital 6 choice pack located in the HUT store before November 19. Six HUT Challenges featuring an Original Six team can be completed to earn the remaining jerseys in the game. In addition to the all-new Digital 6 jerseys, 28 articles of adidas apparel, including the popular Z.N.E. Collection, men’s jackets, pants, half-zips, hoodies and more have been added to the game, creating more opportunities to style and customize your player in NHL 19’s groundbreaking new game mode, World of CHEL. NHL® 19 is available for PlayStation 4 computer entertainment system and Xbox One. For more information on EA SPORTS NHL, visit the website at www.easports.com/NHL and join the conversation on Twitter and Instagram via @adidasHockey, @EASPORTSNHL, @NHLBruins, @NHLBlackhawks, @DetroitRedWings, @CanadiensMTL, @NYRangers, @MapleLeafs, #teamadidas. adidas is the official authentic outfitter of the NHL® on-ice uniforms, featuring ADIZERO Authentic NHL jersey. At the forefront of innovation, design and craftsmanship, the ADIZERO Authentic NHL jersey takes the hockey uniform system to the next level by redefining fit, feel and lightweight construction. adidas Hockey’s NHL roster includes 3-time Stanley Cup® Champion (2009, 2016, 2017), 2-time Conn Smythe Trophy winner (2016, 2017), 2-time Olympic Gold Medalist (2010, 2014) and 3-time Ted Lindsay Award (2007, 2013, 2014), Sidney Crosby of the Pittsburgh Penguins; 2-time Art Ross Trophy (2017, 2018), 2-time Ted Lindsay Award (2017, 2018) and Hart Memorial Trophy winner (2017), Connor McDavid of Edmonton Oilers; Stanley Cup® Champion (2011) and 5-time All-Star, Tyler Seguin of the Dallas Stars; Stanley Cup® Champion (2011) and 4-time Selke Award winner, Patrice Bergeron of the Boston Bruins; Norris Trophy Winner (2013), Olympic Gold Medalist (2014) and 2-time All-Star, P.K. Subban of the Nashville Predators and Norris Trophy winner (2014), NHL Foundation Player Award winner (2015) and 5-time All-Star, Brent Burns of the San Jose Sharks, 2018 Calder Trophy (Rookie of the Year) winner, Mathew Barzal of the New York Islanders and 2017-18 NHL All-Star Game Tournament MVP and 2017-18 Calder Trophy (Rookie of the Year) finalist, Brock Boeser of the Vancouver Canucks. Electronic Arts (NASDAQ: EA) is a global leader in digital interactive entertainment. The Company develops and delivers games, content and online services for Internet-connected consoles, mobile devices and personal computers. EA has more than 300 million registered players around the world. In fiscal year 2018, EA posted GAAP net revenue of $5.2 billion. Headquartered in Redwood City, California, EA is recognized for a portfolio of critically acclaimed, high-quality brands such as The Sims™, Madden NFL, EA SPORTS™ FIFA, Battlefield™, Need for Speed™, Dragon Age™ and Plants vs. Zombies™. More information about EA is available at www.ea.com/news. EA SPORTS, Battlefield, The Sims, Need for Speed, Dragon Age, and Plants vs. Zombies are trademarks of Electronic Arts Inc. John Madden, NFL, NHL, and FIFA are the property of their respective owners and used with permission. PlayStation is a registered trademark of Sony Computer Entertainment, Inc. NHL and the NHL Shield are registered trademarks and NHL Awards name and logo are trademarks of the National Hockey League. NHL and NHL team marks are the property of the NHL and its teams. © NHL 2018. All Rights Reserved.